Capacities from 125 to 360 pounds. 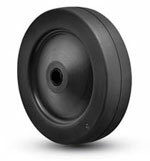 Solid Rubber Material - Provides excellent cushion for the load. Bearings - Straight roller, Oilex, Ball. Temperature Range - -40ƒF to +200ƒF.